“I’m on board with the concept of personalized emails, but I’m still having difficulty (or don’t know) how to run personalized campaigns.” If you’re thinking this, you’re definitely not alone. More than 70% of brands find it difficult to run personalized emails even though they’re 6 times more effective according to a 2013 Experian study covered by Marketing Land. Why is this? One of the biggest challenges marketers face is in finding effective ways of collecting relevant and up-to-date information from subscribers. Sometimes the challenge lies in getting your subscribers to engage with your brand or asking them the right questions while other times it’s not easy to integrate your marketing software and channels. Worse yet if this is a manual process. There are many ways in which you can move data into MailUp to enrich the recipient database and send more personalized messages, including integrations with many CRM and ecommerce systems. Another way is to ask your subscribers to update their profile, maybe giving them an incentive to do so (e.g. Enter your birthday and get a free gift on your special day). In MailUp that’s a feature called Profile Updates, and it hadn’t been updated in a while. So we decided to spend time on it for the MailUp 8.9.1 release, which will be available to all customers on Wednesday, Jan 27, 2016. And that’s what this blog post focuses on. For a more complete look at what’s new in the new release, check out the changelog. Let’s look at what changed in the Profile Updates feature. If you haven’t used this feature before, a Profile Updates form is essentially an online form linked from an email message and used to collect additional information from your subscribers. It’s not a sign-up form, but rather a form that updates your subscribers’ profile with data that you decide to collect in order to send messages that are more relevant to them. Our Pizza Lover newsletter profile updates form is asking subscribers for their first name, their favorite pizza, and which Pizzeria location they visit the most often. All of this information is important for us to gather in order to provide better, more targeted, and even location-based promotions to our subscribers. All of this information is saved in the recipient fields that are available in MailUp. 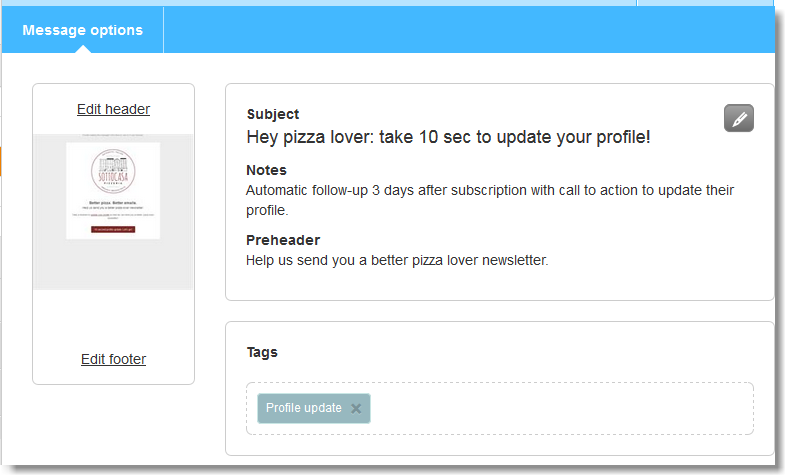 Drag-n-drop: building a profile updates form is easy! Let’s look at how to build the actual form in more detail. In this new version of MailUp we took the same drag-n-drop form builder used for subscription forms and made it available for creating Profile Update forms. This means that you no longer need to worry about how to create or edit a form in HTML. You can now easily drag-n-drop fields and configure them as you wish. This includes adding radio buttons, check boxes, and groups among many other options, and customize them to meet your needs. Now that you’ve created your profile updates form, you can link to it in any of your email messages. If you are building your message using the drag-n-drop email editor, you will find a list of profile update forms to link to both when editing text (Special links > Profile updates in the toolbar), and when selecting a link URL for an image or a button. as shown below. Wouldn’t it be great if you could effortlessly enrich your contact database by automatically asking your subscribers to update their profiles? You can certainly do so, and it’s very easy to set up. Continuing on the example above, the Pizzeria Lover email could be sent as an automated email that’s triggered when a certain condition apply. For example, it could be an automatic follow-up message sent 3 days after new subscribers sign-up to the Pizza Lover newsletter. You can add a link to a profile update form in many places, from a link always available in the footer of your messages (Update my profile) to dedicated promotions (Tell us your birthday and get a free widget on your special day) to automatically triggered email campaigns like the one above. We hope that the improved Profile Updates feature will make it much easier for you to collect relevant information from your subscribers and send them better, more personalized and targeted messages. We look forward to hearing your thoughts in the comment section below!